At 226 Pearl Street, Council Bluffs, Iowa stands the Squirrel Cage Jail. Built in 1885, it contains three floors of revolving, pie-shaped cells inside a ‘squirrel cage.’ The object of the design was to jail offenders with little to no personal contact between them and the jailer, providing ‘maximum security with minimum jailer attention.’ For nearly a century, the Squirrel Cage Jail housed lots of people who made bad choices in their lives. It’s now a part of American history, and that jail design is a thing of the past. The gray squirrel is a common tree squirrel in eastern North America. While its greatest value may lie in its reputation as a natural forest regenerator, to many it’s simply a rodent that should be relocated or terminated. The squirrel is busy at first light, often throughout the day and nearly to last light, seemingly everywhere: in trees, on the ground, in flower beds and vegetable gardens, bird feeders, garages and attics, sampling whatever it likes, leaving behind partially eaten fruits and vegetables and holes in walls and manicured lawns where it stores nuts for future consumption. The gray squirrel’s greatest weakness lies in its irrepressible urge to sample anything that piques its curiosity and appetite. Even with a full belly, it can’t resist the urge to make a bad choice and find its way into a Havahart trap, lured by something different, then caught by its irrepressible urge to sample it. Like a jailed offender, it pays the price for making a bad choice based on insatiable curiosity and appetite. Are we any smarter than the gray squirrel when it comes to making good choices about our physical and mental health? If our answer is no, or we’re not sure or even aware of our choices, perhaps it’s time to examine the choices we make, then set ourselves free from the squirrel cage jail we sentence ourselves to. 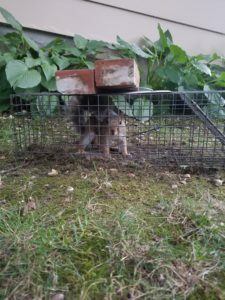 Unlike the squirrel that’s penalized for walking into the cage, lured by its curiosity and appetite, maybe it’s time to leave the cage we trap ourselves in, to explore with a renewed curiosity and appetite. Often, I witness others in the ‘same old routine’ of their daily lives, trapped in their own squirrel cage of doing things out of habit rather than developing an interest or curiosity to try something new or different. I see it in private and public, in cars, on sidewalks, stores, gyms, around friends or strangers…everywhere. It was an interest in and fascination with trying things I’d never imagined or done before that enabled me to pursue the path of a SEAL after joining the Navy to be a ship fitter. I didn’t know what to do with my life after leaving behind a promising future as a musician, then a meager attempt at post-secondary education followed by unskilled labor jobs. In Navy boot camp, puffy-chested guys in tight tee shirts introduced themselves as SEALs, showed a propaganda film about SEALs, and I was hooked. A physical screen test I barely passed, along with additional screening, got me orders to BUD/S training following ship fitter school. I showed up at BUD/S weighing 165lbs soaking wet. Surrounded by dozens of physical specimens who weighed at least 20lbs more than me, I was sure I’d made a huge mistake and wouldn’t last a week. But my past life was gone. Boot camp had changed me. I was fascinated with being among guys from all walks of life and corners of the country, incarcerated in Spartan conditions while indoctrinated in a new society of honor, courage and commitment that was the Navy. BUD/S changed me more with more of the same, along with daily physical and mental challenges that required personal grit and teamwork I’d never experienced. My curiosity to challenge myself with other like-minded individuals kept me fired up and more determined than ever to adapt, overcome and succeed at training that is constant and fast-paced. I’d left my own squirrel cage that I’d trapped myself in the past 3 years and never looked back. My focus was in the moment and the near future, and there was no thought or even opportunity for ‘same old routine’ riding on a fast-moving train that threw you off if you didn’t catch it, stay on, and head toward the locomotive that pulled it down the track. To this day, I remain wary of that ‘same old routine’ and deliberately try new things or doing the usual things differently. I fear and even despise the notion of every day being like the previous, even when it is. If I end up weighed down like the gray squirrel in the Havahart, I’ve lost my heart and my way. Too busy or set in your ways to break out of your norm? Feeling maximum security in your squirrel cage by minimizing the stress of new and different? Think you’ve got your daily routine down and only need to tweak it, or don’t have time to make time for change? I’ve never met anyone, anywhere, ever that I didn’t believe would benefit from some change in his or her life, breaking free of that squirrel cage, even if just long enough to find newfound curiosity and fascination from ‘the same old routine,’ perhaps doing something new and different with complete strangers. What’s holding you back? Remember, it was a fascination or opportunity that made you curious and hungry in the first place. Then, somehow, over time and out of mindless thought or mental weariness you succumbed to what once piqued your attention but now has trapped you inside yourself and a routine…and subtle or profound mediocrity. Choose to find your way out and don’t look back. Be in your new here, now and find comfort in change. Founded by former Navy SEAL Bill Atkinson, Elemental Edge Training offers highly organized, fast-paced half, full and three-day workshops that enhance your ability to lead, follow, communicate and participate as an individual and on a team. Lectures, discussions and practicals, and a rapid fire “Plan-brief-execute-debrief” format hammer home why you’re here and what you must change to improve your personal and professional life. We also teach you a Navy SEAL mindset approach that’s a game changer for you and your team and includes direct and immediate feedback, along with “report card” to take home round out the experience, give pause for reflection, and inspire further change.